There are 3 other images of this object. This object has no known copyright, and as such we offer a high-resolution image of it. See our image rights statement. See more objects with the color rosybrown sienna darkslategrey darkolivegreen darkolivegreen or see all the colors for this object. This and 7 other objects are a part of a set whose first object is Suite Of Micro-mosaic Jewelry (Italy), 1800–25. This is a Earrings. It is dated 1800–1825 and we acquired it in 1991. Its medium is gold sheet and wire, glass mosaics. It is a part of the Product Design and Decorative Arts department. 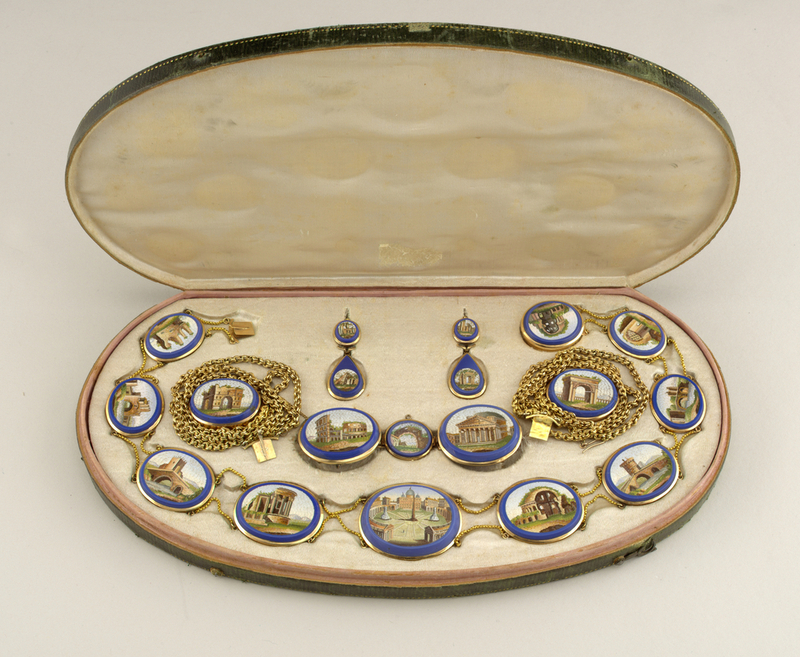 Unique micro-mosaic parures (suites of jewelry) were a popular souvenir among tourists traveling to Italy on the Grand Tour. These delicate baubles captured the bella vistas of Italy’s most famous sites. Designed for women, a parure traditionally consisted of a necklace with matching bracelets, earrings and a brooch or pin, although some also included accessories such as hair ornaments and tiaras. The process of making micro-mosaic jewelry was extremely labor intensive, precise work. A craftsman would use tweezers to patiently arrange hundreds of colored tesserae, small pieces of glass or stone, on a pane of glass. The finest work can achieve up to 5,000 tesserae per square inch. Any gaps were filled with a colored wax and the piece was then carefully polished. It is estimated that there were between 150 to 200 workshops in Rome creating micro-mosaics by the middle of the nineteenth century. The tesserae in this parure were mounted on gold filigree and ringed with a rich cobalt blue border. Its mosaics feature Italy’s famed ancient ruins, architecture, and pastoral scenes, including the Pantheon, the Coliseum, the Temple of Vesta, and St. Peter’s Basilica. This object was donated by Frederick Saal. It is credited Gift of Frederick Saal in honor of Dr. and Mrs. Joseph Saal. This object was previously on display as a part of the exhibition	Excavating Design: 18th-century Drawings and Prints from the Permanent Collection.